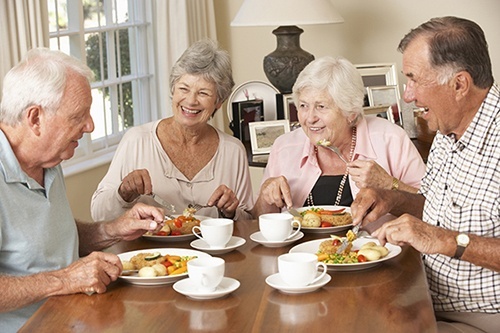 It’s no secret that skipping meals and improper nutrition are common among seniors. Seniors also have a tendency towards isolation and eating alone as they become less mobile, both physically and with respect to transportation. The good news? The Peninsula boasts mealtimes to which residents look forward, not only because they receive freshly prepared, well-balanced food, but also because each meal is a social event — both of which they were missing at home. As a matter of fact, the residents’ feedback is that dining at The Peninsula is their favorite time of the day! “Chef James,” the professionally trained chef who oversees all the meals, is a favorite among the residents. “There is no difference between cooking a chicken at a five-star hotel or at an assisted living community,” says Chef James, who adds that he loves cooking for the residents. The menu has a four-week cycle, meaning that what is on the menu today will not appear on the menu again for four weeks, he explains. Lunch is intended to be the main meal of the day and features hot entrees for residents to enjoy. Hot food is also offered at dinnertime. Breakfast is made to order with eggs cooked as you like them, along with ham, sausage and bacon. Of course, hot and cold cereals and fruit are also available. Residents’ favorites include home-style food like Jewish-style brisket, roast turkey and baked salmon. There is always a choice of homemade soup or salad, three potato variations, rice or pasta, and a vegetable. To top it all off, four to five desserts are offered, including sugar-free options and fresh fruit. All meal menus at The Peninsula are approved by a registered dietician.